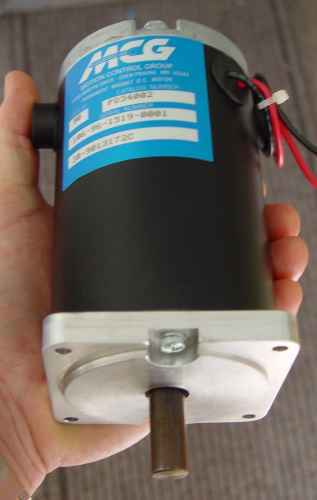 These new NEMA 34 size PMDC motors are ideal for CNC retrofitting. 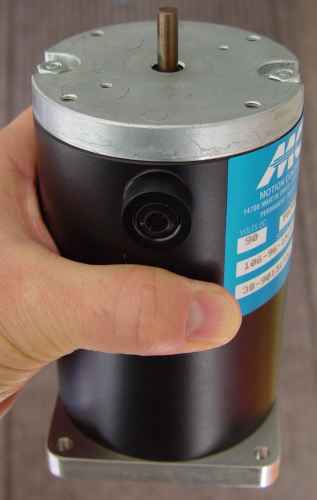 They are encoder-ready with a 1/4" dia x 11/16" long shaft on the rear plate. Torque is an impressive 540 oz-in peak, and 75 oz-in continuous. Output shaft is 1/2" dia x 1-1/8" long. No-load speed at 90 VDC is 1965 rpm. This means you could achieve a servo-locked speed of about 1200 rpm with a Geckodrive G320 at 80 VDC, upwards of 0.65 HP output for short periods, with 0.1 HP continuous output. I am myself using these motors for CNC drives with Geckodrive 320 controllers on a Bridgeport Series 1 milling machine table. With ballscrews, the machine tunes to move reliably at 90 inches/minute. 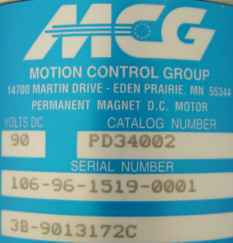 For detailed sizes and specifications, see the MCG PD34000 PMDC Motors specification sheet (72 KB PDF file). Price: $130.00 plus $10.00 shipping. USA destinations only. Free shipping on additional units. Sorry -- Sold Out! (9/2006) Spares available for previous buyers. Have a comment or question about the MCG PD34002 motors?